The wings are bent and feet are out to slow down so much that it is possible for this large seabird to land safely. Often they do two to three approaches before the final landing near the nest. This picture was taken by the Falkland Islands on the Island Steeple Jason, where around. 30% of world population black-browed albatrosses breed. A small part of the colony is situated near a ridge, and here it was possible to come very close to the landing birds. My Canon 1D Mark III - one of the world's fastest cameras - had a hard time trying to follow the fast flying albatrosses at close range and get sharp images. This one is taken with a 70-200mm at 70mm on a distance of 2.7 meters (8.9 feet). 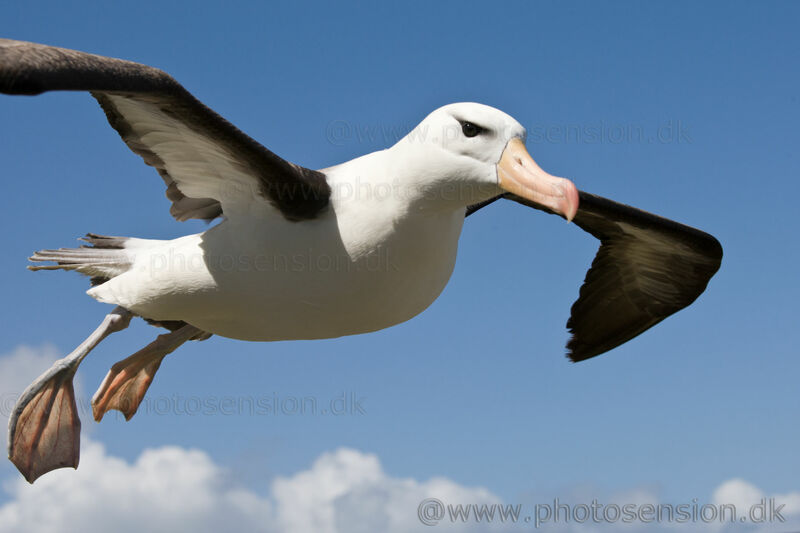 Close-up picture of a Black-browed albatross (Thalassarche melanophrys) coming in for landing with feet out to slow down.